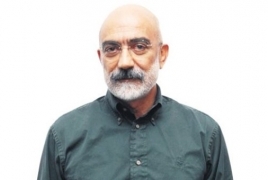 PanARMENIAN.Net - Sentenced to life imprisonment in Turkey, Turkish journalist and novelist Ahmet Altan continues work on his ambitious series, the Ottoman Quartet, from Silivri Prison outside Istanbul. The fourth book of the series tackles the Armenian Genocide, a subject so taboo in Turkey that anyone who mentions it risks jail for “insulting Turkishness,” Publishers Weekly says. Last February, Altan and five co-defendants were sentenced to life imprisonment for their alleged involvement in a 2016 coup attempt. Although Turkey’s supreme court had ruled that “no one could be arrested based on such evidence,” prosecutors insisted that the defendants had sent “subliminal messages” urging the overthrow of the government via television appearance and newspaper columns, and a panel of three judges agreed. An international outcry greeted this blatant violation of human rights and freedom of the press, including protests from PEN and Turkish Nobel laureate Orhan Pamuk. Publisher Sandro Ferri, cofounder of Edizioni E/O in Italy and the English-language Europa Editions (based in New York and London) signed a deal with the jailed author to publish in Italian and English (translated from their original Turkish) Altan’s series of historical novels known as the Ottoman Quartet. (Ferri will also sell translation rights in other languages.) The first volume, Like a Sword Wound, will be released by Europa in October; Love in the Days of Rebellion will follow in fall 2019. The third novel, Dying is Easier than Loving, is not yet scheduled, and Altan is working on the untitled final volume in Silivri Prison outside Istanbul. “I think the best narration of the dark and bloody face of history is found in literature,” the author says. “Literature doesn’t only give us the historical truth, it also enables us to form emotional linkage to what happened in history, it enables us to carry inside the marks of the events of the past." The Armenian Genocide (1915-23) was the deliberate and systematic destruction of the Armenian population of the Ottoman Empire during and just after World War I. It was characterized by massacres and deportations, involving forced marches under conditions designed to lead to the death of the deportees, with the total number of deaths reaching 1.5 million. The majority of Armenian Diaspora communities were formed by the Genocide survivors. Present-day Turkey denies the fact of the Armenian Genocide, justifying the atrocities as “deportation to secure Armenians”. Only a few Turkish intellectuals, including Nobel Prize winner Orhan Pamuk and scholar Taner Akcam, speak openly about the necessity to recognize this crime against humanity. The Armenian Genocide was recognized by Uruguay, Russia, France, Lithuania, Italy, 45 U.S. states, Greece, Cyprus, Lebanon, Argentina, Belgium, Austria, Wales, Switzerland, Canada, Poland, Venezuela, Chile, Bolivia, the Vatican, Luxembourg, Brazil, Germany, the Netherlands, Paraguay, Sweden, Venezuela, Slovakia, Syria, Vatican, as well as the European Parliament and the World Council of Churches.